All About Featured Images - Feast Design Co. Featured images are not meant to be displayed in the post itself. Note: Featured images are not automatically set within the post itself, they are used for the thumbnail areas throughout the theme. If you’d like to include the featured image in your post you’ll need to add it directly into the content of the post. The way featured images work with our themes is that the Genesis Framework automatically pulls the first image that was uploaded to a post (not necessarily the first image appearing in the post, but the image in the post that was first uploaded) as the featured image. If you’d like more control over which images are used as your featured image you can open the post editor and add a featured image manually. Just navigate to Posts > All Posts and then select the post for which you’d like to set the featured image. 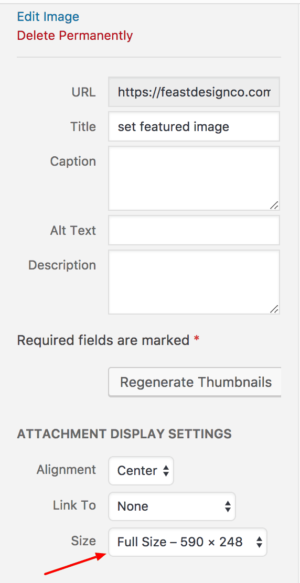 Once in the post editor you can scroll down a bit and look on the right hand side of the page for the option to set a featured image. You’ll want to make sure that you are using featured images that are the minimum recommended size for your theme and we encourage you to edit your photos in a photo editing program prior to uploading and then to choose the full size image for upload. See the Foodie Pro, Brunch Pro, Cook’d Pro, Cravings Pro, and Seasoned Pro FAQs for information about image sizing for your specific theme.